Jana and her husband were so excited when they learned she was pregnant with twins. One of the twins, Whit, was so active at Jana’s 24-week ultrasound that it was hard to grasp what they were told by a high-risk obstetrician afterwards. “My husband and I melted into a puddle of helplessness,” Jana recalled. Jana was then referred and admitted to Texas Children’s Hospital, where the medical team assured her that they would fight for Whit's life. And that’s exactly what they did. The next 10 weeks were filled with numerous ultrasounds and other tests to monitor Whit and his medical struggles. Then, during one of Jana’s routine weekly appointments, Whit’s heart nearly stopped. To save his life, she was immediately taken to labor and delivery. Weighing 4 pounds and 10 ounces, Chap needed time to grow. 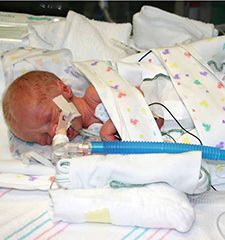 Whit, who weighed a fragile 1 pound and 15 ounces, needed extensive care. Whit finally came home weighing 4 pounds. Around his family, especially his brother Chap, Whit thrived. The months to follow were filled with doctor appointments, more diagnoses and new bumps in the road. Whit began occupational and physical therapies for a mild cerebral palsy diagnosis, but he never looked back! At 12 years old, Whit is now a successful gymnast who loves performing on the rings and parallel bars. 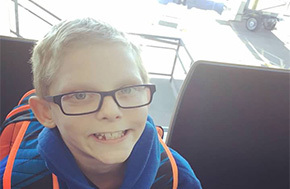 When he’s not at the gym training, you’ll find him playing catch with Chap, hitting golf balls, helping his dad with jobs around the house or playing the ukulele with his sister. 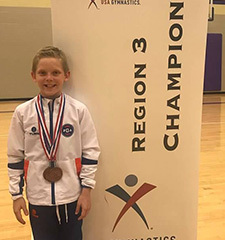 “Today, when I watch my son compete as a Level 7 gymnast, I have to pinch myself to remember it’s real,” Jana said. “I’m forever grateful for the fabulous work and dedication from the Texas Children’s NICU team and for their help with the battle that precious little baby had to live through,” Jana shared.